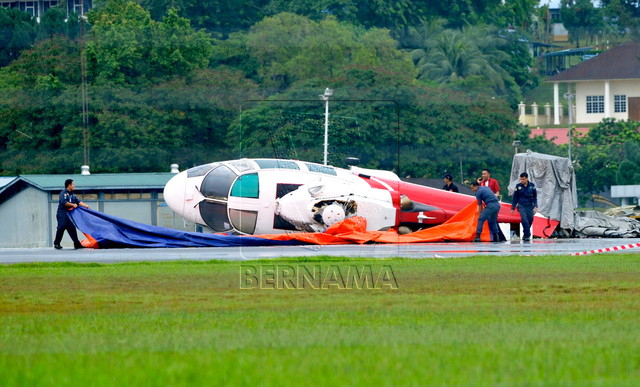 KUALA LUMPUR: Home Minister Datuk Seri Hishammuddin Tun Hussein and his family escaped injury when the helicopter they in were landed on its side due to strong winds at the Royal Malaysian Air Force (RMAF) base in Sungai Besi here today. Hishammuddin, his wife, daughter and son-in-law were the passengers in the helicopter hired from a private company. “Hishammuddin was returning to Kuala Lumpur after voting in Johor (in today’s general election,” he said but declined to elaborate further. He added that the flight crew were also unhurt.